Meet staff member Jill Foshee. 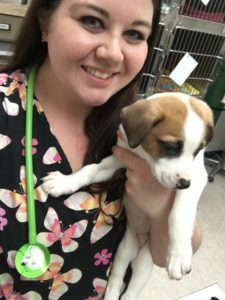 Jill is a certified veterinary technician who has been working at the shelter for nearly 3 years! During these three years, she has helped countless animals get, and stay healthy so that they can find their forever homes! Jill says that the most rewarding part of the experience is watching how much of a difference in quality health care makes in the animals. She recalls watching animals who seemed like they had lost hope blossom after receiving proper veterinary attention. But her work doesn’t end when she leaves the shelter, Jill has taken her work home with her. She is the proud mother of a Humane Society of Sheboygan County alumni – a guinea pig who goes by the name Tabasco. When she’s not taking care of Tabasco or showing beef cattle, Jill enjoys all things art. Her talents include drawing, painting, crocheting, and even homemade greeting cards! You’re a woman of many talents Jill, thank you for working with us and for making a huge difference in the animal’s lives!